The former Speaker of People’s Majlis, Abdulla Shahid should be expelled from Maldivian Democratic Party (MDP) and pressed with criminal charges, says Minister of Economic Development, Mohamed Saeed. 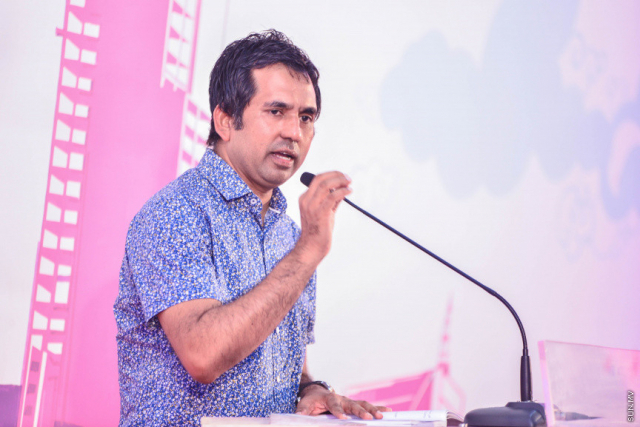 Speaking at Progressive Party of Maldives (PPM)’s function at the Rumaalu-2 last Tuesday night, Saeed said Shahid has humiliated the Maldivian people, and that he should not be allowed into any political party again. “MP Abdulla Shahid should be expelled from MDP. He should not be allowed into any political party. Someone elected to defend the Constitution supporting the declaration Maldives is the backyard of some foreigners is something he should be prosecuted for,” said Saeed. Saeed likened stating Maldives as the backyard of some people to stating Maldives as the toilet of some people. “Saying Maldives is someone’s backyard is like saying Maldives is the bathroom or toilet of someone. Where’s our shame? Where’s their shame? I beg your pardon for saying this. I cannot say certain things because of my position. But I’m saying this as a Maldivian,” said Saeed. He said lawmakers were right to grant a 30-day extension to the 15-day State of Emergency declared in the country on February 5. He said that Maldives has maintained its independence because of people who fought for it, and that President Abdulla Yameen Abdul Gayoom has also fought for the independence of Maldives.